We dont make your wedding, we live your wedding. Your wedding and Our Blog = Perfect D-Day! Make a perfect knot story! Yeah we know it’s all about embracing the western culture these days. And to some the typical arranged marriage thing may not appeal . But it is what it is . Arranged marriages still are an integral part of the Indian Culture. So the other day we were discussing the entire process and the pro’s and con’s of just putting yourself out there ( now we are not at all getting in the debate ). If you may say its blind dating! (with officially involving your parents )! 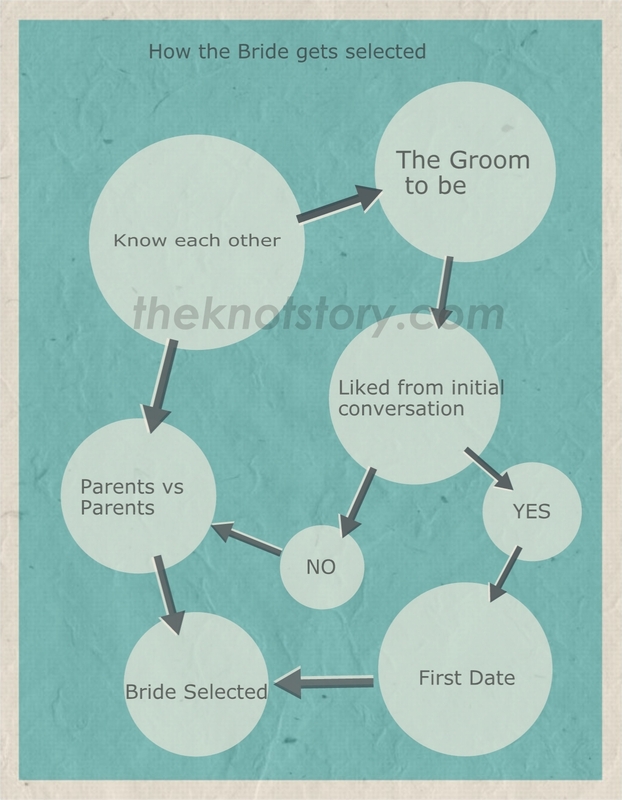 Coming to think about it, Dating like the west with an Indian touch to it 😛 So instead of writing down the whole process of how you seal the deal on your bride 😉 We give you an infograph of how an arranged marriage bride is selected! And if you have an experience you would like to share on your arranged shaadi write to us! Or if you are going to experience the same also write to us with your excitements, anxiety, fears and queries. This entry was posted in Family, Introduction, Wedding / Marriages, Wedding Planning and tagged Bride, Family, indian wedding, People, Relationships. Bookmark the permalink. where would you plan your dream destination wedding? Enter your email address to follow theknotstory and receive notifications of new posts by email.